In June 2012 I was fortunate enough to be asked for the third time to join the international tasting panel for the Radici Festival of native grapes, held each year in Puglia, in the ‘heel’ of Italy. When I first attended in 2009 the festival celebrated the indigenous grape varieties of Puglia, but now in its seventh year it has grown to encompass all of the Italian South, including wines from Campania, Basilicata, Calabria and Sicily – but still with the focus firmly on the native grapes of each region. Radici truly is a celebration of not only the terroirs and varieties of the south, but of food and culture too. Meals concentrate on Slow Food, with the abundant produce of Puglia shown at its best by some passionate and gifted chefs, such as the wonderful A’Crianz in the town of Putignano, where chef Stefano D’Onghia cooks Italian soul food with extraordinary flavours, all using local artisan produce. Radici is also a unique wine competition in that there are two separate juries, working independently, and tasting all of the wines in the competition. One is composed of international ‘professionals’ – journalists, wine buyers and distributors – the other of ‘wine lovers’ – highly experienced and passionate Italian aficionados of southern wines. Each jury awards scores and determines prizes independently, so at the culmination of the competition there are two sets of awards – one from the professionals and one from the wine lovers. The recipient wineries seem genuinely delighted to receive an award from either panel, as each represents a valid, but perhaps slightly different approach to the evaluation of the wines. Above, the 2012 competition in progress. 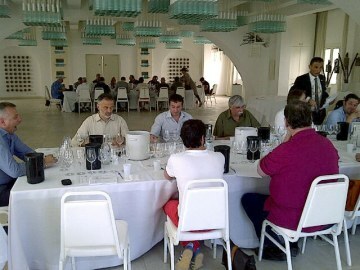 Below are my notes on all the wines that won an awarded in Radici 2012. The list covers the champions and runners-up from each panel, and whilst I was part of the ‘professional’ panel (a talented and amiable group of tasters representing the UK, USA, Australia, Holland, Germany, Denmark and Italy) I have included my notes for all awarded wines. Lovely zingy aromatics here – loads of pungent, herb-tinged fruit and some lemon rind. On the palate this is deliciously full, with excellent balance of fruit and crisp acidity. Not so expressive as some wines here, but nice nutty and apply qualities, with a big sour lemon blast of acidity on the palate. Joint runner-up. Sherbetty, bright stuff this, with a bit of tanky, cold ferment aroma, but juicy and appealing. Juicy on the palate too, with good fruit. Buttery, rich, a little oak here I think. The palate too is rich and quite creamy, and this is delicious if ultimately quite simple. Joint runner-up. Big, ripe, bold and rounded nose of crunchy fruit with a touch of nuttiness and honey. Creamy stuff, the palate has very good fruit and an orange peel acidity. See all UK stockists of Falanghina from Campania on wine-searcher. Fine, bright, quite perfumed wine with lemon and juicy pear fruit. Ripe and very attractive on the palate, with real freshness here and a bit of palate weight. A touch of herbs, bold apple and pear and real freshness here, with a mineral tang. Really juicy palate, lots of orange and lip-smacking, tangy appeal. Plenty of floral Muscat character, with decent fruit but not a convincing expression of the grape. Nice nose here, with its touch of leafiness and crisp pear expression. A touch of cool Asian pear and nettle too. The palate lacks a touch of sweet fruit perhaps, but fabulously pithy and punchy. Another wine with a geranium-like lift, plenty of floral character. Lots of punch here and a good mouthfeel, if a touch short. Gently nutty character here is appealing, with a suggestion of ripe fruit. Pleasant, balanced and nicely fresh. Touch of herbs, touch of cool lemon. Some pithy, dry character on the mouth, just lacks a little fruit sweetness but nicely fresh. Joint runner-up. Quite full, with decent fruit but lacks a bit of personality. Pleasant. This is quite full and dry, perhaps a little dull after the Sauvignon-like fireworks of the previous wine, but the palate has a toffeed ripeness and this is dry, savoury and very fine. Restrained nose, with a suggestion of minerality and stony character, some under-ripe pear fruit. The palate has lovely quality: dry, but juicy with that apple crunch really appealing and good acids into a long finish. Loads of cracked wheat and yeasty character here, nutty – like puffed wheat. Palate has lots of stony minerals that come through, but juiciness too and this ends with delicious tang. Joint runner-up. Elderflower and passionfruit aromas suggest big Sauvignon-like character (yeast influence?). The palate is vibrant and fresh with lots of flavour, but is this a good expression of Cataratto? A bit short. See all UK stockists of Cataratto from Sicily on wine-searcher. The nose is clean, with plenty of apple and pear fruit and though not hugely aromatic, a touch of honey too. On the palate this has that typical Fiano trace of phenolic bite, but the character is there and this has great length. Hints of minerality here, of herbs and greener, fresher notes. The palate has juicy fruit sweetness on the mid palate, with some hints of tropical fruit. A commercial style, but fine quality. Slightly non-descript nose, some orchard fruits. A bit of lemon peel too in an authentic but rather reserved style. The palate has creaminess, a trace of bitterness but nice balance. A touch of nuttiness here but a rather reticent nose. The palate is pithy and dry, has a touch of bitter endive herbs. See all UK stockists of Fiano from Campania on wine-searcher. Rose-hip and cherry, nice fruit and carries through onto the palate. Rather more ripeness and juiciness than some here. Fresh redcurrant fruit and a touch of herbs. Not particularly punchy for a rosé, but appealing with some sour lemon freshness. Quite spicy and rich, lots of dark fruit and a serious character. Ripeness on the palate, with big fruit and a hint of tannin. Fairly anonymous nose, some fruit but dry and a touch watery on the finish. Masses of new oak here, with coconut and vanilla rather swamping the fruit. Big, plush and very impressive if, for me, a touch too much oak. Some blood-streaked, slightly herbal qualities here and a bit reduced. The palate is much nicer: sweet fruit, ripeness, a touch of residual sugar, but attractive. Some freshness here, something leafy and a touch underripe, but good black fruit comes through on the palate. Sweet and chocolaty, perhaps a touch hot in the finish. Warm, rich and a touch baked, this has plenty of oak but is appealing. The palate is maybe just a touch too oaky and hot, but juiciness comes through and this finishes with some structure and freshness. Cedary, sophisticated, a bit of vanilla. Too sweet on the palate – too much like old-school Australia? Certainly drying with too much oak. A touch raisined and oxidised, but soft, enveloping stuff with that touch of gravy browning to the very sweet-fruited palate. See all UK stockists of Nero de Troia from Puglia on wine-searcher. Older, more oxidised in style, this has meatiness but a big, sweet-fruited palate that is resolved and delicious. A little oxidised, gravy browning character. Soft, not lacking pleasure on the palate but simple. See all UK stockists of Negroamaro from Puglia on wine-searcher. Lovely nose, singing with cherry and herbs and a punchy appeal. Modest touch of oak perhaps? Juicy and fresh on the palate. Quite a meaty tone here, with bold cherry fruit. The palate has good fruit that is juicy, firm and finishes with tangy authority. Same as professional panel’s runner-up. Joint winner. Rather a lot of oak here, but has concentration certainly. Good fruit, but the oak – too much with coffee and charriness dominating. Same as professional panel’s winner. Joint runner-up. Plenty of sweet oak, good fruit then it does seem stretched a little thin on the palate. See all UK stockists of Magliocco from Calabria on wine-searcher. Nice, expressive, typical perfume with cherry and kirsch lift and slight ashy character. Juicy on the palate, this is abundantly fresh if simple. Joint runner-up. A very fragrant oak nose here. svelte and attractive on the palate too with just too much oak giving a slightly resinous aspect to the finish. Same as professional panel’s joint runner-up. See all UK stockists of Nero d’Avola from Sicily on wine-searcher. Nice nose here, the oaked is refined and the fruit to the fore. The palate is dry, but it is fruit extract and tannin not oak, and there is a purity to this solid, ripe wine. A lot of stalky green notes here, but not unattractive. The palate has a core of juiciness, but I think the oak tannins slightly strip the finish. Joint runner-up. Big, bold, cedar and toast nose, dominating some plummy fruit. Loads of sweet coffee and toast, but too much oak. See all UK stockists of Aglianico from Campania on wine-searcher. Dull, slightly rotty nose, oversweet on the palate with a touch of bitterness to the oak tannins. Joint runner-up. Slightly soapy nose, lots of lift and confection. Lighter in style, it is quite dry and pleasant on the palate. See all UK stockists of Aglianico del Vulture from Basilicata on wine-searcher. Big vanillin nose, big coca-cola ripeness. Appealing but a little international in style. Rather hot and alcoholic, but then it does have a fine, creamy texture and that mouth-filling fruit ripeness. A big wine and a touch too smooth for its own good, but undeniable quality. A bit green and stalky this, a bit underripe, but it has a certain juicy freshness and no shortage of sweet fruit on the palate. Quite good length, but not hugely complex. A touch baked and stewed, the aromatics are dulled here and there’s just too much sweetness on the palate. Big, sweet-fruited nose, with cherry and red berries, a fresh touch of herbs. The palate is flooded with sweet fruit and this is stylish, juicy and long. Joint runner-up. Ripe, rich, some creamy depth to this. The fruit is juicy and ripe on the palate making for nice, very approachable drinking. See all UK stockists of Primitivo from Puglia on wine-searcher. Some green, leafy herb aromas add freshness here. Is there a touch of Brettanomyces? If so it fits well in the picture, with a palate showing real sweetness and some complexity. Gentle, clean stuff, not too much oak and majors on fruit. Tangy, delicious and fresh on the finish. Joint runner-up. Slightly dull aromatics, just misses the juicy freshness of the best here. Slightly barnyardy aromas here, a touch dank and oxidised. Is this entirely clean? The palate has a pleasing fruit sweetness, some gentle creamy oak and decent balance. See all UK stockists of Gaglioppo from Calabria on wine-searcher. For me a little volatile, this is good on the palate but suffers from the VA.
Joint runner-up. Very nice perfume, sweet fruit and cherry lift. Brightly focused, this has overall balance and juiciness. Same as professional panel. See all UK stockists of Taurasi from Campania on wine-searcher. French oak influence is cedary and creamy. The bitter cherry freshness of the fruit really comes through on the palate, with a long, tangy finish. Aromatics slightly reserved, though much fresher on the palate. Just needs a little more flesh on its bones. Joint runner-up. Creamy cherry, something herbal too. A touch soupy perhaps, quite liquoricy and dense. Joint winner. Same as professional panel’s runner-up. See all UK stockists of Nerello from Sicily on wine-searcher.